Cost: $90 Full session (ten classes)/$10 drop in. Theatrical belly dance blends the emotion, drama and storytelling of the theater with the beautifully passionate and expressive art of belly dance. By connecting emotion with movement through a combination of dance drills and improvisational theater exercises the dancer discovers, and learns to express, their creative voice. Each class includes work with foundational belly dance movements and improvisational theater exercises. Classes are conducted to live music. During this session students will co-create a performance piece to be presented at this year's Snowflakes & Shimmies. The classes are open to beginner and intermediate belly dance students. Students will need to dress in comfortable clothing that allows a wide freedom of movement. Each individual brings their own history and personal story to the dance. In recognition of this I seek to create a safe space for students to explore, and step beyond, the current boundaries of their dance. Led by Eric LaPerna of Okbari, this workshop for hand percussionists takes the mystery out of playing the belly dance drum solo. Participants will learn how to create a drum solo by fusing together the most popular dance rhythms in three different drum solo forms in a way that is easy to understand for both the drummer and the dancer. Mr. LaPerna will also cover how to ornament the individual rhythms that comprise a drum solo as well as drum solo improvisation. 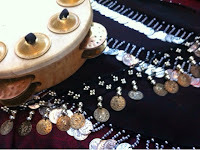 The workshop is open to intermediate hand percussionists and is limited to 10 participants. Participants must bring their own instruments. The workshop runs for three hours with a half hour break for lunch. Eric LaPerna is a classically trained Arabic percussionist. During his 27 years of playing hand percussion he studied the iqa'at (rhythmic modes) Riqq, Tabla and Duff with master Palestinian drummer Michel Merhej and Turkish, Armenian and Greek rhythmic systems with Alan Sharvarsh Bardezbanian. Mr. LaPerna is the Director of the Bowdoin College Middle Eastern Music Ensemble, and is a member of the Applied Music Faculty at Bates College as well as adjunct instructor of hand percussion at Bowdoin College. He is a member of Okbari and also plays with Alhan, Zapion and The Ensalada Early Music Ensemble. Every Sunday from 9:00am - 4:00 pm Baxter Boulevard in Portland, Maine becomes a car free landscape open to walking, biking and on this summer's second Sundays, belly dance!!!! 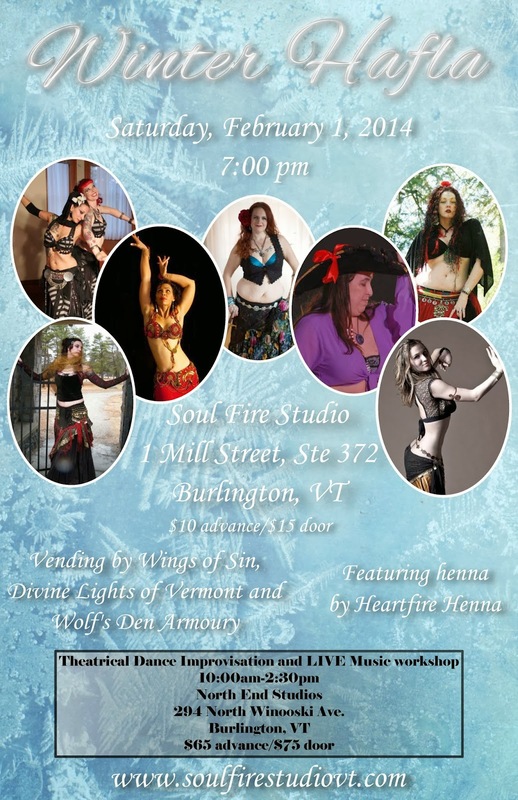 This one hour dance is open to all levels; no belly dance experience necessary! Grab your hip scarf and join belly dance instructor Joie Grandbois for belly dance on the boulevard. Come move, dance and celebrate summer's imminent return. All levels of belly dance are welcome. The hour begins with a gentle warm up followed by a low impact belly dance lesson plus time to share movement with open dancing. Live music will be provided by drummer Stephen Carpenter! Bring yourself, some water, sunscreen and your happy feet! Hip scarfs will be available for borrowing. The workshop page has been updated with all of the latest! To find out where and when I'll be teaching click here! “You demystified the drum solo!” - workshop participant, M.P. Performing to live music can be intimidating, performing to live music that is improvisational can seem terrifying. But it doesn’t have to be this way! In our Belly Beat Basics introductory workshop dancers will learn Middle Eastern rhythm basics, gain comfort with live music and learn how to creatively improvise to a drum solo. The class includes an introduction to rhythm with an overview of instrumentation and a study of four common Middle Eastern rhythms. Dancers will learn how to take the rhythm from the mind and into the body with dance combinations that can be used in practice and performance as well as how to craft their own combinations! Exercises in stage presence and how to overcome stage fright will aid dancers in creating a greater level of comfort with performance in any setting as we move into drum solo structure. Dancers will learn how to move on and between the beats, how to anticipate what is coming next and how to create emotional connection with the audience. And of course that all important skill, how to communicate with your drummer! Students will also receive a CD with the four rhythms covered in the workshop and a short drum solo to practice to at home! While this is an introductory workshop students are expected to have taken at least one session of belly dance classes or have a basic understanding of belly dance movement. In order to facilitate free exploration we seek to create a safe space for all types of dancers to explore creative expression. Mistakes are not only expected, but encouraged. Theatrical belly dance blends the emotion, drama and storytelling of the theater with the beautifully passionate and expressive art of belly dance. By connecting emotion with movement through a combination of dance drills and improvisational theater exercises the dancer discovers, and learns to express, her creative voice. The classes are open to any dance student who has taken a minimum of at least one full session of belly dance classes. Each individual brings their own history and personal story to the dance. In recognition of this we seek to create a safe space for students to explore, and step beyond, the current boundaries of their dance. Yesterday my performance troupe, Dark Follies, gathered to share a New Year's Eve brunch and to watch the film that was one of the inspirations for the troupe's name and show style, "Ziegfeld Follies." Watching that film brought me back to when I was a child and first saw it. The last time I saw the film I was about nine years old; too limited in experience to understand some of the comedy or to pick up on some of the racial stereotypes presented in performances such as Fred Astaire's appearance a Chinese laborer in Limehouse Blues. What I do remember feeling nearly overwhelmed by the costumes, the sparkles, the music and oh the dancing! When I watch films like "Ziegfeld Follies" or any such old style Hollywood musical/dance film I find a lot of inspiration. What strikes me the most about them (aside form the glorious over the top splendor) is the artistry involved. Everything from the sets (which would today be done almost exclusively with CGI) to costuming to lyrics, everything is done with such intent. Nothing is unnecessarily a part of the performance and the performers, whether singer, swimmer, dancer, comedian or musician do what they with so much skill and know their parts so WELL that the life and voice of the character is able to fully sing. While I think of my solo creative work and that of the troupe I realize I want to bring just that sort of artistry to my performance. While neither I nor the troupe have the funds or time to put on events of Hollywood scale, I do believe we can create performances with that same artistry and intent. In fact I think back to another inspiration for the Follies, the street performers I saw in Boston as a child, and how they were able, with minimal props and costuming, to put on a short show that was as creative and engaging as any old school Hollywood or Broadway show. Being on a small stage or having a small band or having basic costuming need not limit us - the only limitation is that of our own bodies and amount of effort we are willing to put into our creative practice. I am very excited to be co-teaching this workshop with drummer Stephen Carpenter on February 1st in Burlington, VT! Come join the fun. Theater has scripts. Dance has choreography. Music has arrangements. However each of these art forms also has a long history of improvisational performance. In this four hour intensive we combine the improvisational techniques of the theater, belly dance and middle eastern music to create expressive theatrical performance. Theatrical belly dancer Joie Grandbois and musician Stephen Carpenter bring together their performance experience on both sides of the drum to bring this unique workshop to you.While improvisation can be intimidating, they seek to create a safe space for dancers to explore creative expression and where mistakes are not only expected, but encouraged. Rhythm 101 – We often tend to intellectualize music (Wait was that a doum? A tek? How many counts? 1,2,3...uh...9?). Learn the basics of Middle Eastern rhythm in a fashion that moves them out of your head and into your body. Off the “Beat”en Path – we most often keep our accents on the beat but you can also dance around the beat, using the rhythm to accent the peak of a movement, moving within the silence between beats and exploring melody. Mood Combinations – There are particular belly dance movements lend themselves to expressing certain emotions. Combining these movements allows you to create a moment of dynamic emotional expression on the fly. Conversation – Performance to live music is a collaboration between musician and dancer yet sometimes it can seems like we speak different languages. How to communicate with the musicians you perform with before, during and after the show. The workshop is open to dancers who have attended at least two fulls sessions of a belly dance class and have solid understanding of basic belly dance technique. Dancer, choreographer, musician, writer…storyteller. Whether she is using the medium of dance, rhythm or words Joie seeks to bring to life the character present in a creative work. A lifelong dancer Joie entered the world of belly dance through the side door of raqs gothique after falling in love with its dramatic storytelling nature. Her dance explorations have also led to a study of cabaret and Turkish styles of the dance expanding her love of the art form. She is also a student of Middle Eastern percussion, specifically the riqq, and has a love of playing the zills. Blending the arts of music and theater with the improvisational nature of belly dance she brings drama, humor and an appreciation for the unexpected to the stage. In teaching theatrical belly dance Joie seeks to share not only technique but to also create a safe space for dancers to explore and step beyond their creative boundaries. She hopes to initiate the conversation between artist and muse so that each dancer may connect with and express their own unique voice. 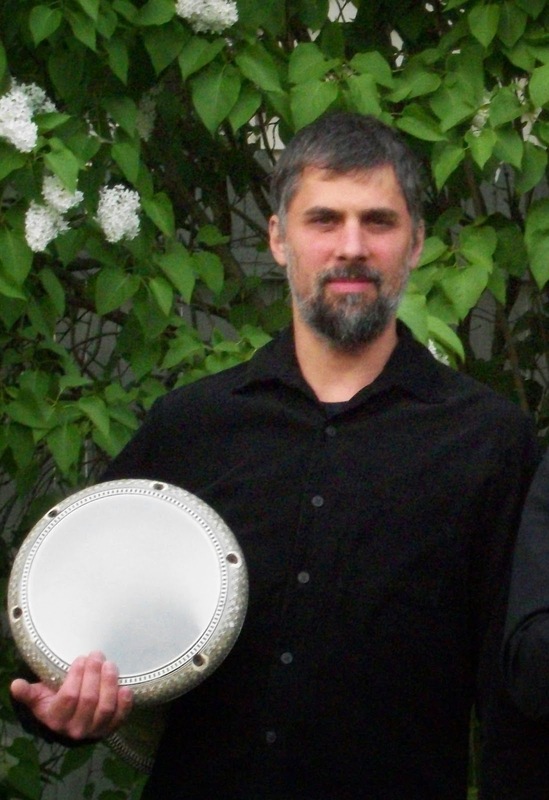 Stephen Carpenter, has been studying hand percussion for most of the current century with a particular focus on the rhythms of the middle east. Stephen has played with variety of performers in Maine and around New England in both stage and classroom settings. Through the voice of the drum and ney he seeks to create a conversation between the music, dancer and audience. He is a founding member of the band Spoonmaker's Diamond and for the past four years he has been the musical director for the Portland, Maine based street vaudeville troupe Dark Follies. Stephen is also a professional woodworker who crafts many of the instruments he plays upon.